Last week was certainly one of the busy ones…an early morning “Breakfast with O’Keeffe” on Monday, two evening events and three school groups! This month’s “Breakfast with O’Keeffe” dealt with the local Bali Art Project, which is an organization that takes a group of high schoolers from Santa Fe to Ubud in Bali. The four-week program, which has been around since 2000, immerses the participants in the Balinese culture by introducing them to the language, art, dance and traditions of the area. The speakers, Gaylon Duke and Zenia Victor opened by talking about the differences in living that they have experience in Bali and how welcoming the people are. They showed slides and videos of the beautiful and vibrant landscape and temples. There were various clips of the students learning to play traditional instruments and songs and taking dance lessons. They showed a video of a large communal cremation, something you certainly don’t see around here! The bodies of the deceased were placed in elaborate animal castings and both locals and tourists were walking around taking photos. 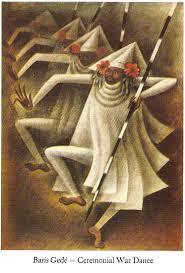 The speakers also showed videos of various ceremonies and rituals; during a clip of a house blessing I noticed that the costumes of male dancers were similar to those seen in Miguel Covarrubias’ painting, Baris Gede, as well as the intricacy of the feet positions. May the odds AND coffee be ever in our favor! That night we had a lecture on “The Book of Tea,” written by Okakura Kakuzo. As a HUGE tea enthusiast (there may or may not be a shelf designated specifically for tea in my kitchen…) this event had been on my list since I opened the fall O’Keeffe program brochure and saw it listed. Never having opened the book (even though we sell it at the museum store and I work there as well…), I had no idea how the lecture would go—an entire lecture dedicated to talking about tea?? It turned out that the lecture, given by American tea master Bruce Richardson who edited the expanded edition of the 2011 edition of the “Book of Tea,” was about the author Okakura Kakuzo and his large influence that even reached Georgia O’Keeffe herself. 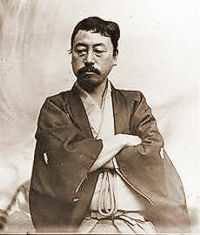 Okakura Kakuzo was born in Yokohama in Japan in 1862; as a child he studied English and at age 15 he began to study at the Tokyo Imperial University. He earned a Masters in Arts degree in 1880, founded Nihon Bijutsuin (the Japan Art Institute), and became the curator of the Japanese and Chinese collection at the Boston Museum of Fine Arts. It was at the university where he studied under Ernest Fenollosa, who was an art historian of Japanese art, professor of philosophy and political economy. He worked with and influenced Arthur Wesley Dow, who in turn taught and influenced O’Keeffe, who also had copies of Kakuzo’s book. Quite a web there, huh? “The Book of Tea” touches on topics such as zen, Taoism, art appreciation, flower arrangements and tea masters in addition to the importance and history of tea in Japanese culture. Richardson gave a great lecture on Kakuzo and really brought him to life. 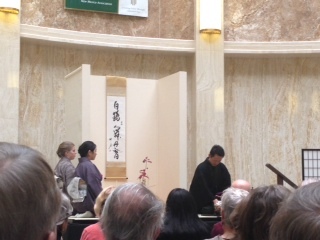 Now that I think about it, I wonder if Richardson was at the Japanese tea ceremony that I attended a couple of weeks ago, it was so cool! 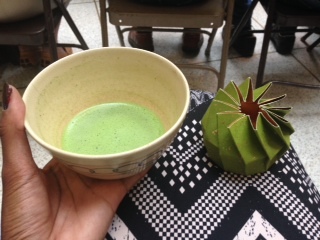 There were people dressed in beautiful kimonos and everyone in the audience was given a cup of authentic (I’m talking green, unsweetened and frothy) green tea as well as an adorable green box of sweets. So this week will be calmer but we’ve still got another gang of tiny adorableness to teach and a family program on Saturday. You know, I think Saturday the 15th is also someone’s birthday…(unfortunately not mine…) Maybe we’ll do something special in her honor! Stay tuned for the next edition of…”Adriana Burkins’ experience as…AN O’KEEFFE EDUCATION INTERN!” Bum bum BUMMMMMMMM! November 11, 2014 in Education.